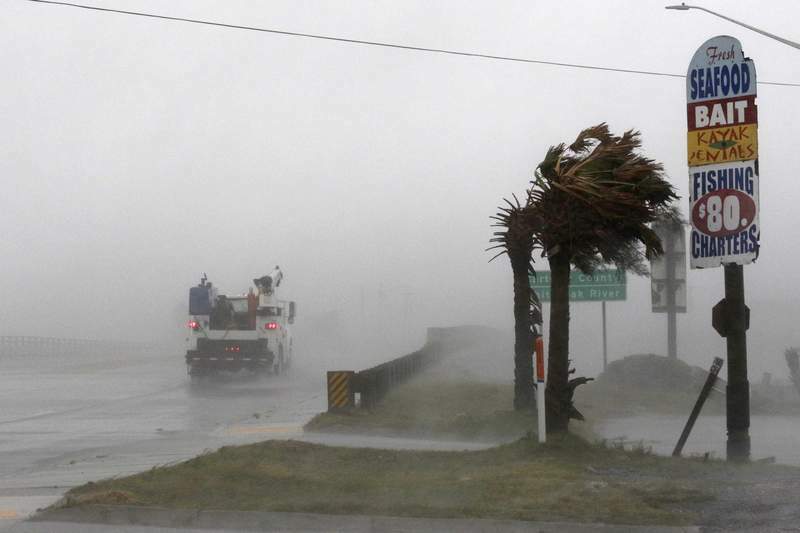 Associated Press A work truck drives Thursday on North Carolina Highway 24 in Swansboro, N.C., through strong winds from the outer bands of Hurricane Florence. 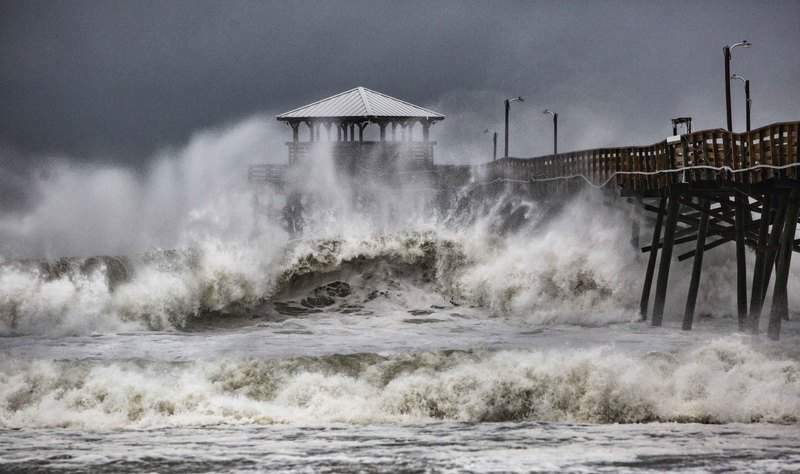 Winds and rain were arriving later in South Carolina, and a few people were still walking on the sand at Myrtle Beach while North Carolina was getting pounded. Forecasters said conditions will only get more lethal as the storm pushes ashore early today near the North Carolina-South Carolina line and makes its way slowly inland. Its surge could cover all but a sliver of the Carolina coast under as much as 11 feet of ocean water, and days of downpours could unload more than 3 feet of rain, touching off severe flooding. Florence's winds weakened as it drew closer to land, dropping from a peak of 140 mph earlier in the week, and the hurricane was downgraded from a terrifying Category 4 to a 1. More than 80,000 people were already without power as the storm approached, and more than 12,000 were in shelters. An additional 400 people were in shelters in Virginia, where forecasts were less dire. Duke Energy Co. said Florence could knock out electricity to three-quarters of its 4 million customers in the Carolinas, and outages could last for weeks. Workers are being brought in from the Midwest and Florida to help in the aftermath, it said. The police chief of a barrier island in Florence's bull's-eye said he was asking for next-of-kin contact information from the few residents who refused to leave. “I'm not going to put our personnel in harm's way, especially for people that we've already told to evacuate,” Wrightsville Beach Police Chief Dan House said.